Possey Power: Girls, help!! 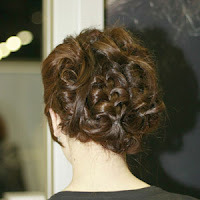 Wedding day hairstyle! Less then a month away!! Girls! I need help choosing a hair style! Hopefully this posting thing worked for the pictures. Keep in mind: I won't be wearing a veil. I will however wear a glittery small tiara. It is a headband type, not princess where it rises. So I need everyone's opinion! Help!! I'm getting a stylist so no worries if it looks to hard. And if you guys have any other suggestions, share them! I'm going for princess/cinderella/fairytale kinda look. Not too primpy or fake looking. Thanks for yo ur help!! I love love love the one where the hair is down! It would be sooo gorgeous!!!! i really like the bottom one, with the blue background! it reminds me of cinderella's hair! love the one with the hair down- since it is still winter- it will keep your neck warm..... and it is sexier! btw- what are your colors?? um, not that i'm going with the crowd, but i prayed about it and i'm switching my answer to the hair down, too!